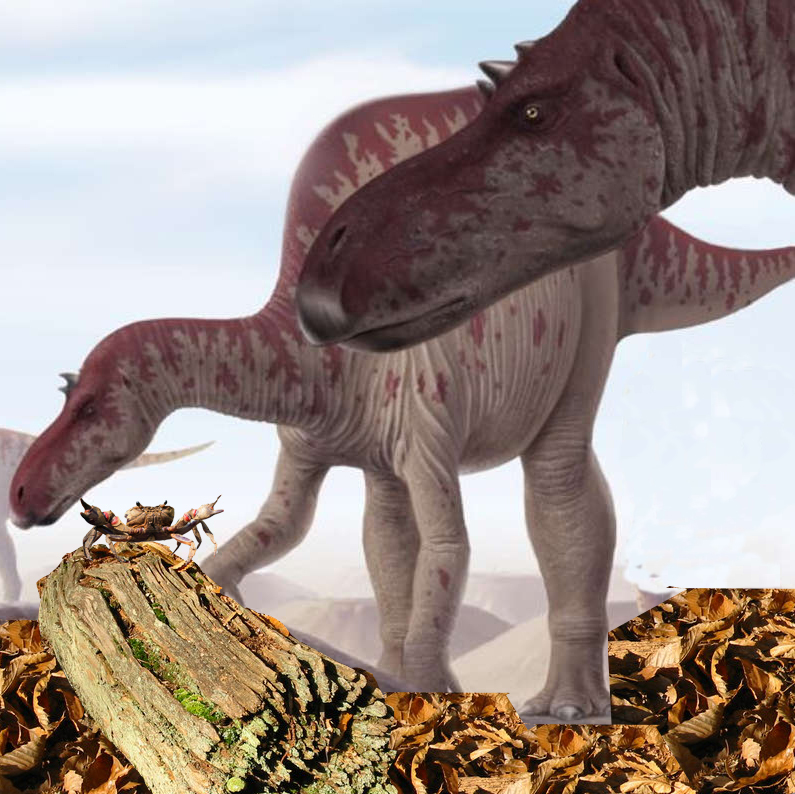 This week, a new [paper] was published that described the largest sauropod footprint ever found from the Early Cretaceous (146-100 millions of years ago) of Korea. The footprint is more than 50cm (20 inches) in diameter! The authors found something very rare inside the footprint: a dinosaur skin impression. That’s the equivalent of leaving a palm print on wet cement, like on the Hollywood Walk of Fame. 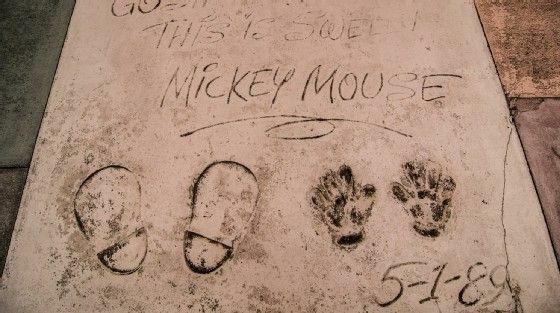 Mickey Mouse’s hand and footprints on the Hollywood Walk of Fame. From Pinterest. The impression preserves interlocked hexagons that have a range of sizes. They seem to get smaller on the outsides of the impression. Figure 2A from the paper showing the footprint on the left and a close up of the skin impression on the right. The authors analyzed the sediment around the footprint to try and understand why skin impressions are so rare. They found that these impressions were left in on a muddy surface that had dried enough to preserve the impression. That muddy surface had to stay dry afterwards, and not get covered over by water. If more flooding had occurred, the print would have disappeared. The muddy surface also had to be covered by a thin layer of bacteria in order to hold the mud together. The combination of these conditions allowed the footprint and skin impression to stay preserved. These conditions can be hard to find in the same place and time, meaning that more dinosaur skin impressions could still be rare in the future. Last week, a [paper] came out discussing the color patterns on the theropod dinosaur Sinosauropteryx. This dinosaur was a small-bodied meat eating dinosaur from the Cretaceous (133-120 million years ago) of China. Figure 1 from the paper showing one of the specimens of Sinosauropteryx. The authors took photos of 2 specimens of Sinosauropteryx under special lighting conditions. 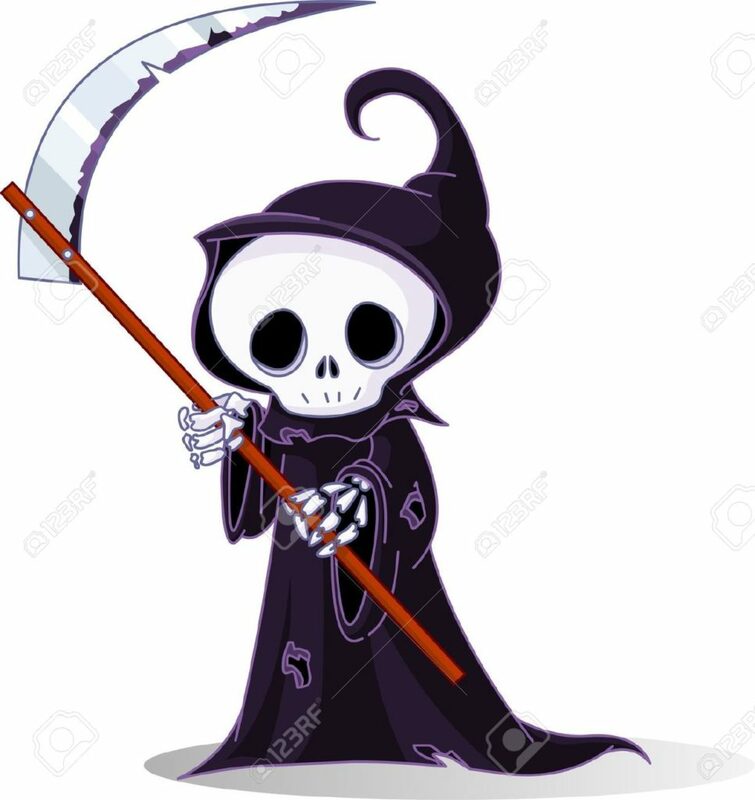 This helped them see the feathers that surround the skeletons. Feathers that had color in them are preserved more easily than feathers without color. So looking at the fossils helps us understand how colors were distributed on the animal. Artists then made reconstructions to show how the colors appeared on the dinosaur. They found that Sinosauropteryx had a striped tail, a bandit mask around its eyes, and a brown back with a white belly. Figure 2A from the paper showing the color reconstruction on Sinosauropteryx. The authors also wanted to test what the colors could tell us about what kind of habitat Sinosauropteryx lived in. Animals that live in open habitats (like deserts or grasslands) usually have darker colors on their back and lighter colors on their bellies. This helps break up their body shape so that predators have a harder time seeing them. Animals that live in closed habitats (like forests) usually are darker everywhere and have fewer areas with lighter colors. Think of the color differences between an antelope that lives in the grasslands, and an okapi that lives in the rainforest. An antelope on the left showing coloration for open habitats. An okapi on the right showing coloration for closed habitats. Okapi from here. To do this, the authors 3D printed models of the dinosaur and photographed it twice: once when it was fully sunny and once when it was completely cloudy. The full sun imitates the open habitat and the cloudy day imitates the closed habitat. They found that the shadows cast on the model on the sunny day match the color distribution found on the fossils. This means that Sinosauropteryx lived in open habitats. 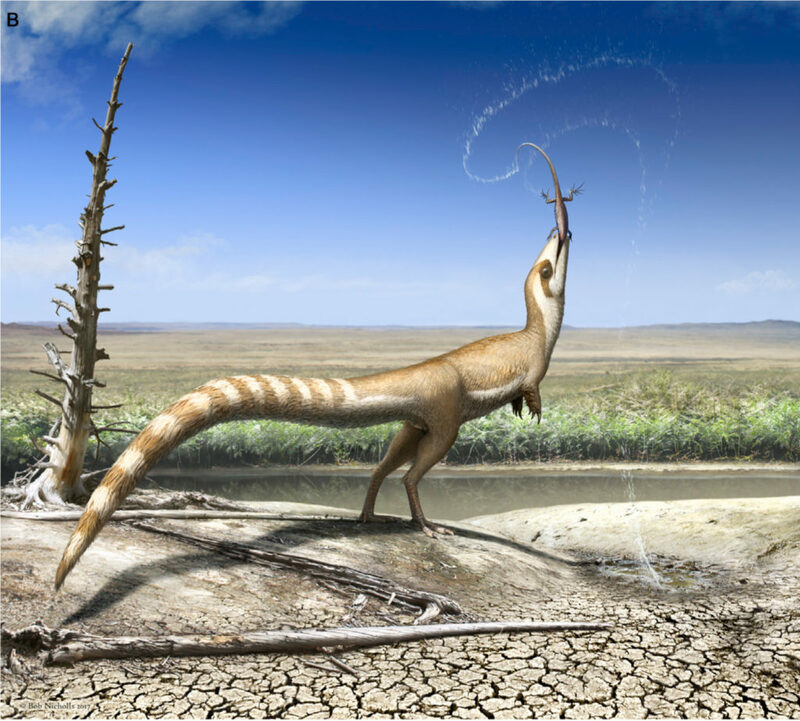 Figure 2B from the paper showing how the open habitat where Sinosauropteryx lived and its coloration. It probably used its bandit mask to reduce the sunlight entering its eyes. The striped tail, dark color on its back and light color on its belly helped camouflage it in open habitats, making it harder for predators to see it, and making it harder for prey to see it coming. This study shows us how new techniques can help us answer questions about how dinosaurs lived. 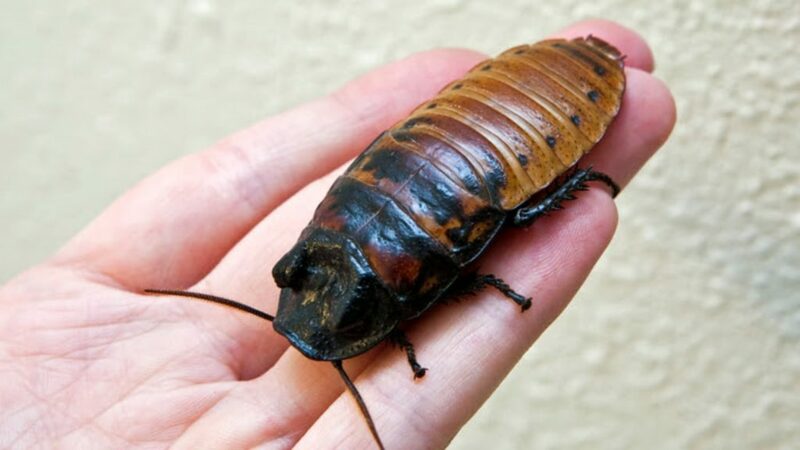 Cockroaches are known for surviving multiple extinction events on Earth. They evolved around the Carboniferous Period (360-300 million years ago) and modern versions appear in the fossil record in the middle of the Mesozoic Era. A Madagascar hissing cockroach. From National Geographic Kids. Now imagine if a cockroach evolved long, grasping arms, and giant eyes for hunting prey. That’s pretty terrifying, right? Well, that’s basically what a praying mantis is*. A praying mantis. 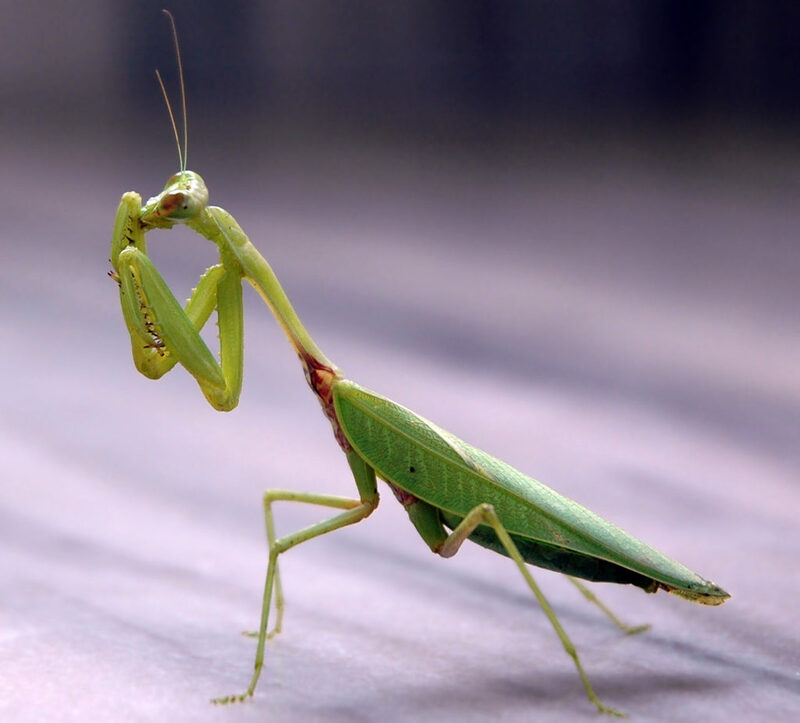 If you think about it, a praying mantis is really the insect form of a carnivorous giraffe. A carnivorous giraffe with knife hands. 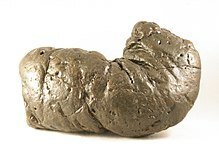 Photo from Wikipedia. Today, praying mantises hunt prey by ambushing animals as they come close. Mantises are normally camouflaged to blend in with their surroundings. When a particularly tasty insect comes by, they attack! They have a single pair of arms they use for catching and holding prey (called raptorial arms). Each arm has a set of spikes that help hold the prey in place. But did they always use one pair of arms for this job? 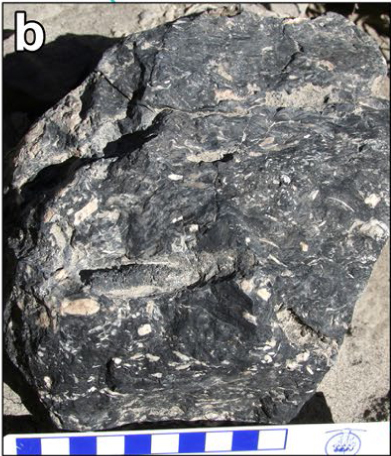 Figure 1 from the article showing the fossil in the center. On the left, the different body parts are colored (eyes are dark blue, head is yellow, body and arms are the other colors). On the right is a close up of the second set of arms. 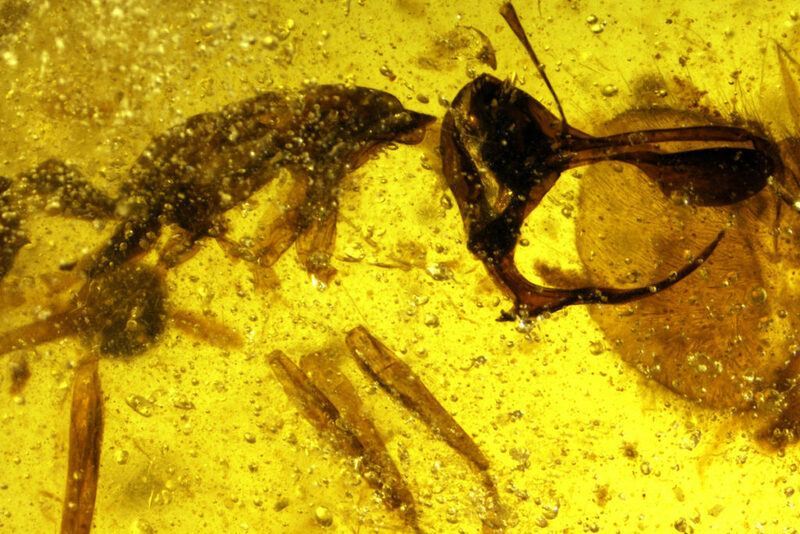 A new 110 million-ear-old [fossil] from Brazil shows us a different idea. 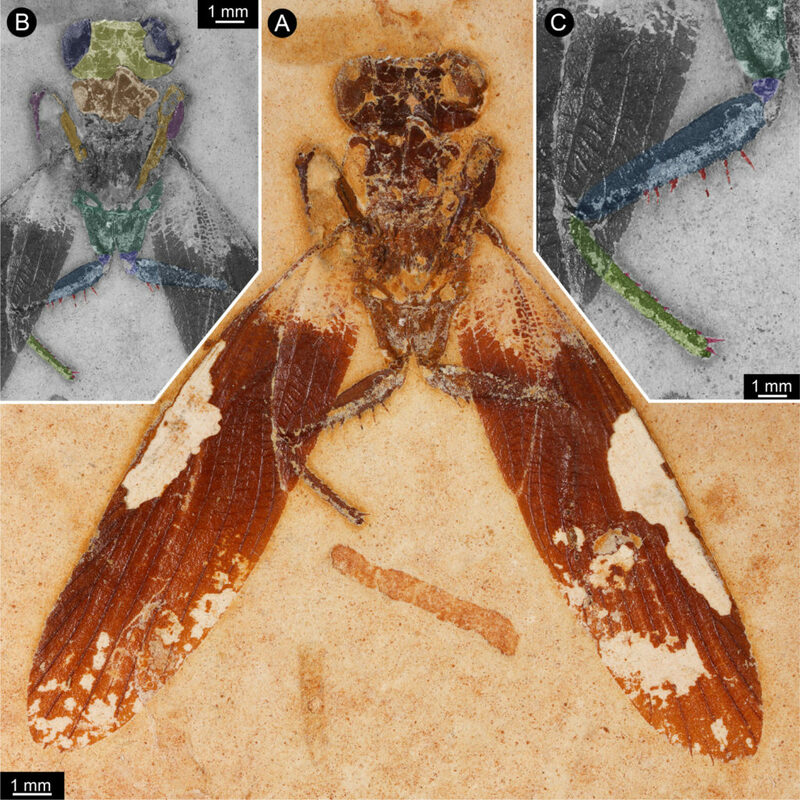 This exceptionally preserved mantis shows a pair of wings, the head, part of the first body segment, and the first two pairs of arms. The interesting thing is that both the first and the second pairs of arms have spikes on them. Since these spikes are used to catch and hold prey in modern mantises, we know that this fossil mantis was probably using its second pair of arms to help hold prey. This fossil shows us that extinct mantises may have hunted a little differently than what we see today. A couple of praying mantis showing their colors. Photo by I. Siwanowicz. 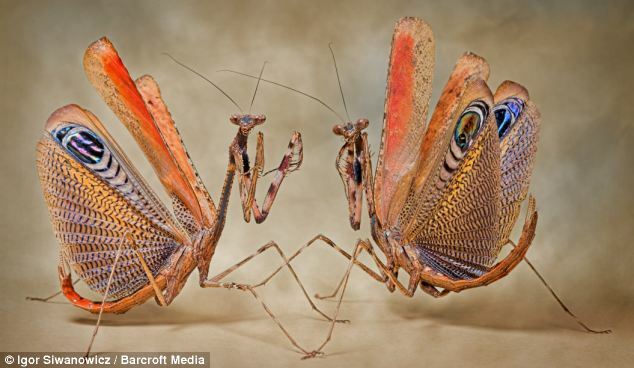 *To be clear, mantises did not evolve from cockroaches. 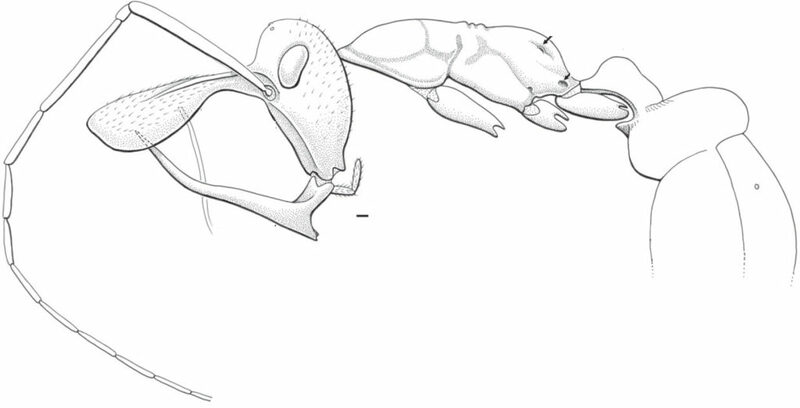 Both mantises and cockroaches evolved from an ancestor that looked more like a cockroach.